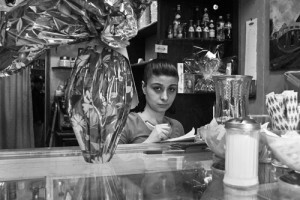 Paul Cary Goldberg’s “Tutta la F amiglia: Portrait of a Sicilian Cafe in America” began in spring 2007 when he started photographing inside Caffé Sicilia. Goldberg writes, “I had been a semi-regular patron for about eight years so I was already familiar to many of the regulars – mostly men, most of Sicilian heritage: fishermen, stone masons, tile masons, businessmen, plasterers, house painters and electricians. Still, we were all wary when I began showing up every morning with my camera… but as is often the case, sharing time together produced a mutual curiosity that wore these barriers down. I and my camera became as much a part of the morning routine as the clattering and tinkling of espresso cups and spoons, the hissing of steamed milk… above all else, those voices speaking Sicilian, all at once, rolling up and down, one louder than the other, insistent, confrontational, passionate, playful, flowing and crashing and ebbing and flowing like Gloucester sea waves through the air across the room.” Goldberg was the recipient of the 2002 Print Center Selection Award, 76th Annual International Competition: Photography, The Print Center, Jacqueline van Rhyn, juror. Paul Cary Goldberg, Tutta La Familigia is Presented as part of The Print Center 100. Opening Reception: Friday, October 2, 5:00 – 7:00pm.